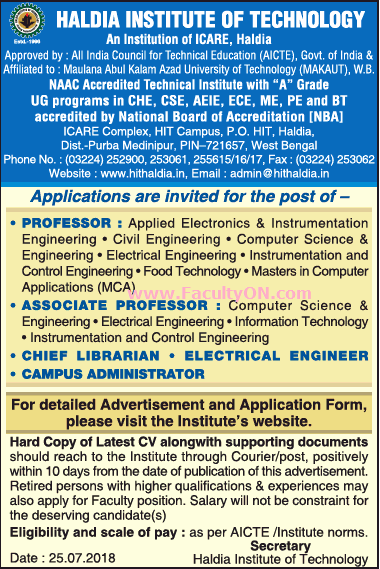 Haldia Institute of Technology, Midnapore has advertised in THE TIME OF INDIA newspaper for the recruitment of Professor / Associate Professor Plus Non-Faculty jobs vacancies. Interested and eligible job aspirants are requested to apply within 07 days from 11th July 2018. Check out further more details below. About College: Haldia Institute of Technology began its journey in the year 1996. It is the first private and accredited academic institution catering technical education in West Bengal.The Institute is situated at Haldia – an industrial hub in Eastern India.